Before Philip Cave gave us two discs of Philippe Rogier (Fanfare 24:1 and 34:6; a third disc has not been sent for review), he made a disc of Robert Ramsey (19:1), expanding the composer’s discography from two works to 17. Now he returns to the Tudor era, and this time the rare entries belong to the equally obscure Robert Parsons (c. 1535-72), known exclusively until recent years for the Ave Maria included here, the only piece that then existed in a modern edition. The breakthrough for Parsons came in 11 works on Barnaby White’s full disc (31:6), followed by another 11 works (six of them new to disc) on Andrew Carwood’s full disc a year ago, even if not as startling a revelation as Cave’s effort on behalf of Ramsey. For two anthems and the lamentations (the last using different texts), Cave couples the settings of different composers. 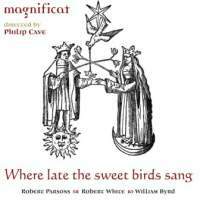 This group records less often than similar Oxbridge vocal ensembles, but what I’ve heard is uniformly excellent (Cave himself has sung with such groups as the Tallis Scholars, The Sixteen, and The Cardinall’s Musick). The program was put together by Sally Dunkley, a longtime member of Oxbridge vocal ensembles beginning with the pioneering Clerkes of Oxenford under David Wulstan; she sang with them (12:1) in both of these Robert White works (the anthem then a first recording), as she does again here. Her notes are detailed and informative. Byrd is given half of the disc. His reply, Quomodo cantabimus, to Philippe de Monte’s offering of the first part of the psalm Super flumina Babylonis is recorded here, even as we were just hearing the fourth coupling of both works (36:4), the ideal way to present these two motets. The lamentation Cogitavit corresponds to White’s Lamentations, which do not use the precise choice of verses found in modern liturgical books (the modern liturgical lamentations include altogether only half of the Biblical text). Byrd’s Cogitavit is in the first volume of Andrew Carwood’s Byrd Edition (21:4), a disc of his early church music. The 18 mixed voices of this ensemble are as responsive as a smaller group while furnishing a warmly blended sound. 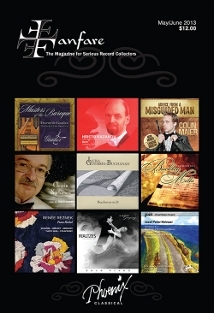 As an alternative to competing versions sung one voice to a part, the works heard on this generous program are recommended.